No one prepared me for this: I would lose my cycling identity in Copenhagen, that badge of irritating marginality to drivers. It was akin to dropping my self-consciousness of growing up Asian-Canadian, a visible minority in small German-based Kitchener-Waterloo, Ontario during the 1960-1970’s. When I moved to Toronto and now, Vancouver, I merged anonymously with masses of other Asian faces. In Copenhagen, a cyclist was swallowed up in a forest of fellow spinners. 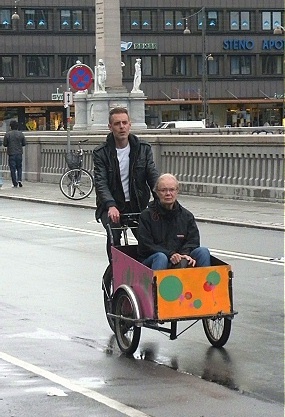 On bike in Copenhagen, you really aren’t noticed as an exception nor a rebel. Over 36% of people in Copenhagen, cycle to work or school for transportation. 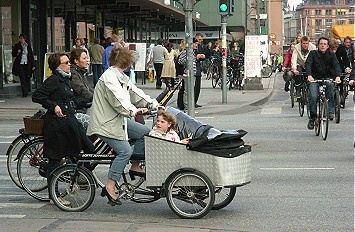 Overall, 60% of Copenhageners use their bike daily (2009). At home, 3.8% of Vancouverites cycle for transportation (2008) which is better than most Canadian cities. I thanked myself for bringing my lycra black skort, a skirt-short combo. I wore the skort more often than expected, in other European cycling-dominant cities before we reached Copenhagen during our trip: Freiburg and Karlsruhe in Germany as well as in Strasbourg, France. I wanted to blend in seamlessly with many other cyclists whirring along in streaming cotton jackets, slacks, skirts and walking shorts. Contrary to many European female cyclists, and contrary to a growing trend in some North American cities for cycling in streetwear, I still wore my cycling jerseys, sans team logos, and other cycling apparel for comfort. Ironically for the first ten years after I returned to cycling mid-life, I wore T-shirts while cycling everywhere. A garment that dismayed lycra –clad cyclists who avoided the drag of any loose apparel flapping in the wind. But I had memory of smelly polyester tops as a 1970’s teenager. I also did not want to be mistaken for a cycling fitness poseur, for doing anything remotely athletic. Odd since I was becoming more fit from cycling than ever before in my life. But now, I wanted to protect my carefully chosen business wardrobe from cycling stains and early tear. I had spent precious dollars and shopping hours tracking down clothing to fit. 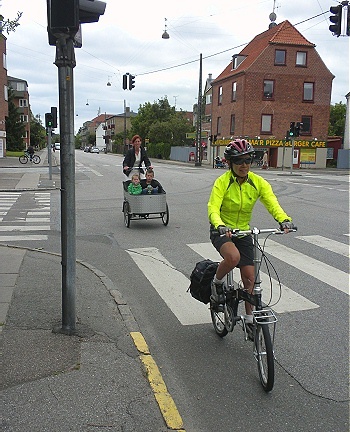 Nevertheless, I still appeared as a North American hyper-cyclist with a helmet poking out among Copenhagen cycling masses. I wore my helmet because I learned my lesson after falling off my bike on black ice twice during winter. I also learned my lesson when I worked for three years at a rehabilitation hospital for spinal cord injured adults in Toronto. A few kilometers away, there was an acute care hospital with a trauma unit. They treated head injuries. 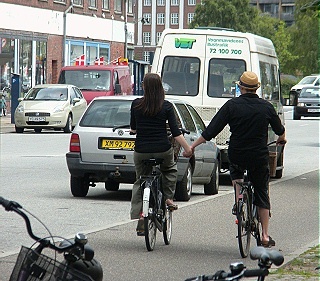 Cycling couple holding hands. Copenhagen, Denmark June 2010. Photo by HJEH Becker. Common in cycling-intensive European cities. It is not all bad to lose a lot of North American frenetic cycling identity. When you shed it, you may drop hyper-focused athleticism that can look fit, but intimidating to emulate by the easy-going couch surfers. While in Prague, I saw our own North American cyclist as near-alien creature, reflected back on us by watching the odd Prague cyclist zipping here and there on bike. The cyclists in downtown Prague were rare and nearly inconsequential. When we were in Prague a few days before Copenhagen, we noticed the paucity of cyclists. With a local cycling mode share of optimistically up to only 2%, Prague is like many North American cities: lacking extensive cycling infrastructure and much lower cycling rates for transportation. Such a contrast to even Freiburg, Germany a city 25% smaller than Prague, with also a cobblestoned core like Prague. 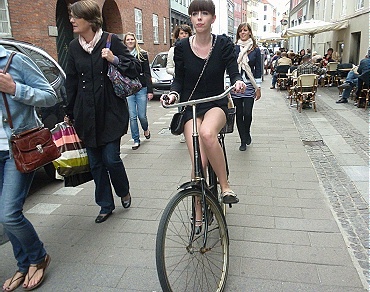 By contrast, Freiburg was thronging with cyclists in streetwear. more cyclists nearby, passing either on my left or right — the latter, I have always found irritating. 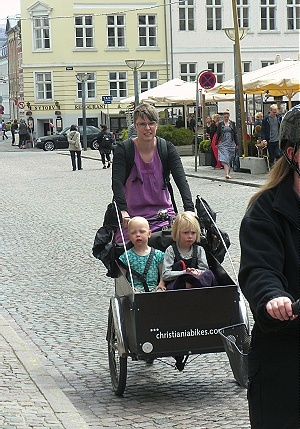 Very few Copenhageners used their bike bells. They didn’t bother to say anything as a warning, if they wanted to pass you on a crowded or narrow path. Perhaps with many cyclists, a ringing bike bell or more might confuse not just one, but several other cyclists around me: who was ringing that bell? who chat side by side in separated bike lanes and cyclists who are not model Copenhagen chic nor fitness oriented. Inclusion also meant a group of eight casually attired teenage girls chatting happily away with one another while they cycled slowly along. One by one, each cycling girl peeled off from the cycling gaggle, on her bike with a wave and onward to her destination. 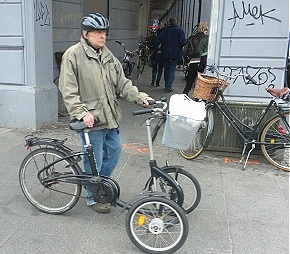 I marvelled at this ordinary Copenhagen social cycling activity. Not often does one see in many North American cities, groups of casually dressed teenage girls cycling in the city for transportation and to socialize. It was striking there was a critical mass of women cycling all the time in Copenhagen. Over 55% of cyclists there, were female. There were short time spurts, when I saw more women cycling than men. Many of the cycling women I saw were cycling solo, strangers to one another and focused on getting to their destinations. timed deliberately to coincide with the flood of 1,000 international attendees for the Velo-city Global 2010 Conference on cycling infrastructure planning, programming and trends. Earlier this past spring, was the UN Summit on Climate Change which brought thousands of marchers into this city. 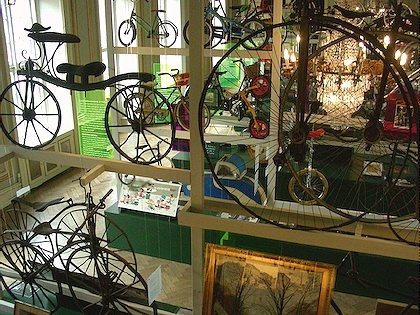 When I arrived, I was advised by museum staff to start from the cycling exhibit and go ‘backwards’ in time to view the historic artifacts from bicycles to medieval. 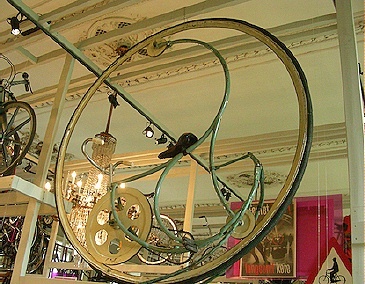 Cycling within a wheel (?). Copenhagen City Museum June 2010. Photo by J. Chong. Surely, for circus performances. exhibit was cleverly executed in tight space. Different bike shapes overlapped one another and became hanging visual abstracts of bike lines and swirls. It was like a carefully designed bike garden that offered different views at every turn, every few steps ahead. Outside the museum, a postman mounted his postal transport bike with his full mail panniers and basket after his delivery at the museum. Like several German cities we visited, Copenhagen postal workers also cycled around and delivered mail from door to door on yellow mail bikes. Such a sensible way to avoid back and shoulder pain for those heavy loads. What prevented me from losing my cycling identity in Copenhagen, was wearing my bike helmet and my narrow mountain bike shoes for more pedal power leverage. Not that Copenhagen had hills like Vancouver. It pains my feet just to pump flat pedals with thin beach flip flops. Nor do I wish to cycle and scuff up dress shoes. Not in Copenhagen or even later back, in Vancouver. But I could gladly live in Vancouver one day with: daily streams of nonchalant cyclists in every age group, patient drivers that do not sit on the car horn at a red light, shops that sell kiddie bikes with real bike racks and more healthier residents. Becker, HJEH. “Cycling in Prague”. Jun. 26, 2010. In Third Wave Cycling Blog. City of Vancouver. Engineering Services. 2008 Annual Bicycle Plan Update. Administrative Report. Supports Item No.1. Presented to Standing Committee on Transportation and Traffic, Jul. 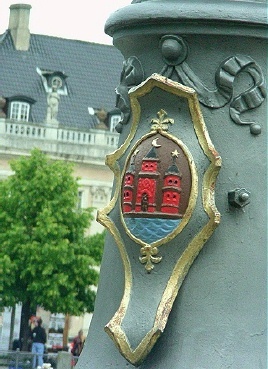 22, 2008. See pgs. 3-4 for update to 2006 Statistics Canada data on city’s cycling mode share. Ekerson, Clarence. 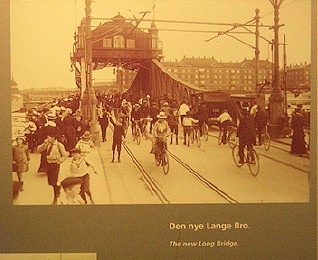 “Cycling Copenhagen, Through North American Eyes.” Includes video by Streetsfilm. In Streetsblog, Jul. 15, 2010. Torslov, Niels. Bicycle City Copenhagen. Presented at National Cycling Congress, Berlin May 9, 2009. Published by: City of Copenhagen, The Technical and Environmental Administration. 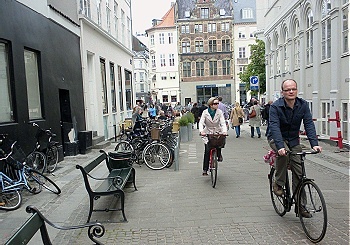 Copenhagen aims to reach 50% cycling mode share by 2015. Jean – I followed the link from the Urban Country blog discussion about the Vancouver Velo-City 2012 promo video. My experience does not include this, but I understand this maybe a gendered issue. My wife, who’s quite the fashionista, rides 3km, including a moderate uphill climbe, to work every day in business attire, wearing her regular shoes, and has never once complained about such issues. Can I ask you what kind of bicycle you ride that makes you fear “cycling stains” and “early tear”? Does your bicycle have full fenders? Does it have at least a three-quarters chain guard (preferably fully-enclosed)? Does it have a skirt/coat guard? Do you ride in an upright position? Do you have hub gears? If you have a bicycle with all of these elements, you have a “city bike”, suitable for commuting to work in your regular clothes. if you don’t, well, I think you should try one before suggesting that cycling normally involves “cycling stains”. As for “early tear”, what do you do on a bicycle that subjects your clothes to such stress? Are your riding faster than 20kph? Are you riding on a racing saddle instead of a comfortable wider saddle? I shouldn’t think you’d get any more “early tears” than simply walking down the street, getting up and down from your desk, and so on. Why do you think you are at risk for this? At any rate, riding your bicycle instead of driving a car should leave you with lots of cash to expand your wardrobe. I have no interest in getting a skirt/coat guard for my bike –I use my bike for cycle-touring trips also over 50-100 km. day trips. It’s a hybrid bike. I am a small person (5’1″) and find it a challenge to buy properly fitted clothing that is good quality so I prefer to save my streetwear and business clothing off the bike. Women’s clothing now are sized for bigger women nowadays..–unless there are clothing styled from Asia. It’s actually cheaper for me in the long run to cycle around in cycling/fitness wear –not streetwear. Remember, just going beyond Calgary is cowboy country, wild bears, coyotes and elk. Our culture is different even if we are urban. Come on over and rough it up!! Welcome : it’s the world-famous Calgary Stampede with rodeos, bucking horses and chuckwagon horse races. This is such an interesting post. Although I’m a regular city-cyclist in London, I’ve never cycled in any other European city (except Brighton which is too hilly for comfort!!) You’ve really made me want to pop over to Copenhagen for a weekend (we Europeans tend to forget we have that luxury available to us!) and check out their cycling infrastructure. I’m quite intrigued by how different cities approach the dichotomy between drivers and cyclists; pretty ineffectually here in London, sadly . . . Yes, Europeans should ALWAYS remember how lucky they are to foreign cultural experiences –just waiting for adventure! Canada is frickin’ huge. My family…live in Ontario: over 4,000 km. west of me, another province! This is why Canadians and Americans go bopping across more than 1 European country when they get enough time (and some money)! You’ll like Copenhagen. Their national museum is cool..a large section on Viking history. Well, it is another adjustment to return to North America where most areas lack intensive cycling infrastructure that is well connected. However it’s good to remember and draw inspiration for days when we don’t feel like cycling and the weather is still fine. Best wishes in 2015, James.